The seemingly endless ethical debate over whether or not student-athletes should receive payment for athletic services is complicated to say the least. Focus needs to be redirected to a more important question, should college athletic revenues be put back into academics? There are books written on the debate, articles, and reports. In an informal survey I found that five out of every 10 people believes student-athletes should be paid. 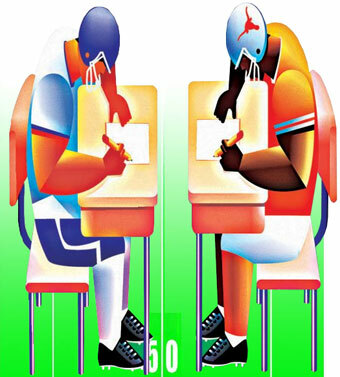 Everyone has an opinion, but let’s not forget that the student-athlete is a student first. There’s even a campaign by State colleges supporting this. However, with the time commitment and physical demands placed on said student, their athletic performance seems to cast a shadow over their academics. Given the current economic strains on higher education, fewer applicants are being admitted into colleges and tuition fees continue to rise. How can colleges offer an incentive to the student-athlete beyond the academic scholarship, to complete a college degree prior to entering the professional sports arena? How do we shift our priorities from athletics to academics? Many report the scholarship is fair compensation. According to the National Center for Educational Statistics the average cost of a four-year degree is $21,189. Student-athletes earn this as well as up to $200,000 for living expenses, training, and academic services. Yet, some scholarships fail to cover a lot of the expenses incurred throughout four years of college and there is no guarantee that an annual athletic scholarship will be renewed for every returning student-athlete. The juggling act of the student-athlete. In an article by Frank DeFord he echoes the sentiments of a Bloomberg report stating revenues incurred by college athletic programs should be put back into academics. “In an environment of fiscal strain confronting state governments, the New Brunswick, New Jersey, school is emblematic of rising tension over funding of athletics at the expense of academics” (Bloomberg). Out of 120 college athletic programs only 14 are profitable, that doesn’t even include the traditionally nonrevenue sports. It stands to reason that there is not a one-size fits all solution to this dilemma. In an economic climate that puts strain on department budgets, some with cuts of $40,000 for photocopies and computer-scanned testing materials, and others with entire social studies department having their office phones removed in an effort to cut spending, can we justify spending even more? When cuts start effecting the learning environment, out-of pocket expenses for instructors and students, it is only reasonable to look at spending as well as revenue across the board. With headlines touting millions of dollars in revenues, we turn to athletics. It’s easy to look at the big programs and apply their situation to all institutions. Seth Davis’s article is intended to rebut Taylor Branch’s article in The Atlantic. The one thing they both seem to agree on is that the system needs to be fixed. Student-athletes are students first and as such, greater importance should be placed on their education. Where there’s big money, there’s controversy and where there’s controversy people listen. Everyone is worried about the exploitation of the students, what about the exploitation of our educational system, one in which states are enforcing detrimental cuts. Why aren’t we focused instead on the broken educational system in our country?